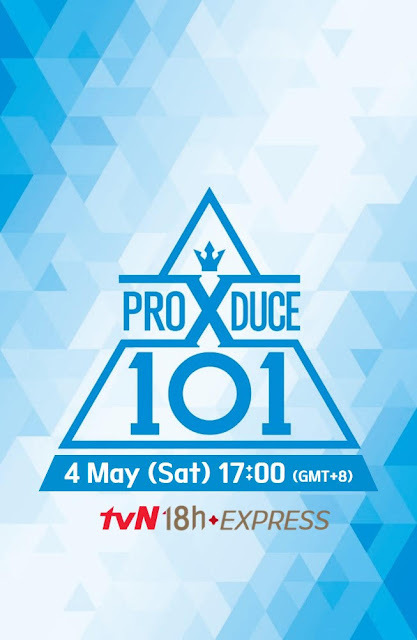 GOKPOP | Exclusive K-News in Malaysia & Singapore: Get Excited for the New Survival Program, Produce X 101: Premiere on tvN on 4 May! Get Excited for the New Survival Program, Produce X 101: Premiere on tvN on 4 May! Striving to provide audience with latest contents promptly, tvN Asia proudly announces its very first 18-hour express variety show – PRODUCE X 101 – enabling K-pop lovers in Asia to keep up with this highly-anticipated survival audition show. PRODUCE X 101 will premiere on tvN in Asia from 4 May (Every Saturday) at 17:00 (GMT+8). The global idol survival audition programme PRODUCE X 101 features 101 male trainees born before 2005, in which they will compete in multiple rounds of elimination and be handpicked by the audience (a.k.a. national producers) through both online and live voting, to form the ultimate boy group. Majority of the contestants come from renowned K-entertainment companies, while there are also some talented individual trainees. All contestants have started their dorm life in March and are undergoing intensive trainings involving singing, dancing, stage performance and team work. Apart from the strong trainer line-up, including rapper Cheetah, singers Lee Suk-hoon and Shin Yoo-mi, as well as dancers Choi Young-jun and Kwon Jae-seung from previous seasons, this year, one of the most sought-after actors and heartthrob Lee Dong-wook will take up the MC role to represent all the “national producers”. Making it even harder to survive, the original ranking system with Grade A through F welcomes an extra Grade, X, depicting the lowest bunch in the spectrum. Additionally, opinions from the national producers will weigh more significantly, PRODUCE X 101, for the first time ever, gives the voting right for title track’s centre position to the viewers. The title track “X1-MA” (_지마), which means “Don’t” in Korean, receives enthusiastic responses from worldwide fans and the performance video has garnered over 3.5 million views to date. Same as previous seasons, PRODUCE X 101 is directed by the famous programme producer Ahn Joon-young, who will deliver intense survival format and impeccable stage performances that rock audience’s visual and audio sense! Furthermore, following the success from previous seasons’ debut groups, I.O.I, Wanna One and IZ*ONE, the winners of this season will receive a five-year contract instead to create a longer impact. tvN’s latest 18-hour express variety show PRODUCE X 101 will broadcast on tvN in Asia from 4 May (Every Saturday) at 17:00 (GMT+8). tvN is available in Hong Kong, Singapore, Taiwan, Malaysia, Indonesia, the Philippines, Thailand, Myanmar and Sri Lanka, the show is paired with English, Chinese, Bahasa Malaysia and Bahasa Indonesia subtitles.